This English site is currently under construction. Can Nuclear Fuel be ‘Recycled’? Many of us feel uneasy when we hear the words "nuclear power." The Japanese government has spent an enormous amount of money educating us about nuclear power. This is because they think that our uneasiness is a result of our ignorance about nuclear power. An increasing number of schools here in Japan have taken on the topic of nuclear power generation in their "Energy and the Environment Education" classes, which is part of the "Comprehensive Study Program" that was introduced into the Japanese school curriculum from 2003. To support this aspect of the school classes the government began distributing many brochures and study materials to schools for free. We found that all this free study material focuses on erasing the uneasiness each student has about nuclear power. We also noticed that it fails to mention the fundamental risks associated with the generation of nuclear power. Furthermore, for students wishing to do further research and homework, the material supplied by the government introduces the web sites of organizations such as the Tokyo Electric Power Company, nuclear power plants, and other pro-nuclear organizations, without any reference whatsoever to organizations that oppose or at least discuss the dangers of nuclear power generation and the nuclear fuel cycle. We believe that it is in everybody's interest to educate our students, the future decision makers of Japan, with knowledge that is well balanced and comprehensive in regards to the generation of nuclear power. With such knowledge, they will be able to decide which energy policies are appropriate for Japan, its people and the local and global environment. We cannot let them decide their future without first informing them of all the aspects of nuclear power, including the negative areas. This NukeText website examines the pro-nuclear material the Japanese government has been distributing at schools around Japan and attempts to correct it and add missing information so students can have a comprehensive understanding of ALL the aspects of the nuclear fuel cycle. Please encourage any students who are interested in learning more about nuclear energy to visit this website! The unknown story of the cleanup workers in the aftermath of Chernobyl. For a higher quality version click here. 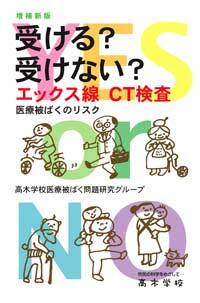 "X-ray・CT- Examinations, Should or Shouldn't I Get One?" Thinking about having an X-ray or CT scan? Read this book to learn about the dangers of these examinations.